If you were hoping that Ryan Adams’ apparent contemplation of a Whiskeytown reunion might signal a softening of feelings toward his native state, forget about it. U.S. tour dates are starting to come together for this spring, and once again North Carolina is nowhere to be found on his itinerary (at least not yet). A stretch in the first half of March finds Ryan playing two dates each in Virginia, South Carolina and Florida — but none in The Old North State, which he will presumably have to drive through to get from Richmond to Columbia. This is pretty much standard operating procedure for Ryan on the road nowadays. During his last major stretch of touring in 2014-15, Ryan made it to every adjoining state without playing in North Carolina, where he’s not played a show since 2005. Come June 8, it will be an even dozen years since the last time. It’s been years since Ryan Adams has lived in (or even visited) the setting for “Losering,” his old pre-fame stomping grounds of Raleigh/Durham/Chapel Hill. A lot has changed in the years since Ryan has been gone, but a few traces of his time here linger into the present day. And below is an artifact, if you could call off-color graffiti an artifact. This is written on a bathroom wall of The Cave, a cool subterranean nightspot on the main Franklin Street drag over in Chapel Hill whose co-owners include Van Alston (Ryan’s “Come Pick Me Up” co-writer). It is of uncertain provenance and looks like something Ryan could have written himself, based on the handwriting and how often he has used variations of “Dracula” as a pseudonym over the years — including “Sad Dracula” and, going way back, “Count Chocula.” And for a limited time, you can get this on a T-shirt, red print on black. They’re gong for $20 while they last. Email MarkConnor@mac.com to check on availability. The headline reads, “Ryan Adams Announces East Coast Dates” — and sure, I took a look even though I knew what East Coast state would be missing. Upon scanning the itinerary below, however, there was a brief moment when I thought that the end of Ryan’s boycott of his native state might be at hand. Look at the bottom date, July 26, “Ryan Adams at Lincoln Theatre”; yes, there is indeed is a Lincoln Theatre in Ryan’s former hometown of Raleigh. But no, that date is scheduled for the Lincoln Theatre in Washington, D.C. (besides which, these days Ryan generally plays venues with far bigger capacities than what the Raleigh Lincoln Theatre can hold). Oh well. I will note that, given the political drift in North Carolina nowadays and who else is boycotting the state, I can’t really blame Ryan for keeping his distance at this point. As we’ve covered, it’s been a mighty long time since I’ve seen Ryan Adams onstage. The last time was almost 11 years ago, when he came to Raleigh’s Meymandi Hall in June 2005 and played a tense, shambolic and kind of wonderful homecoming show that nobody realized was actually him saying goodbye. Maybe not even Ryan himself. For whatever reason, Ryan has chosen to stay away from his old hometown and native state, to the point that he’s played every adjoining state within the past year — but not North Carolina. I’ve stayed away, too, not going out of my way to see a show of his elsewhere. Wednesday night, however, found both Ryan and me in Austin, Texas. And if I can’t see him play in Raleigh, seeing him play South By Southwest is probably the next best thing. Ryan was booked into a ballroom at the fancy new Marriott Hotel downtown, on a bill with (irony of ironies) that proudest of North Carolina acts, the Avett Brothers. Ryan goes back 20 years with SXSW, which is where Whiskeytown had its big music-industry breakthrough show in 1996 — a night when Ryan was so nervous, he was almost too overcome with stage fright to play. Even so, that was the show that pretty much launched Ryan’s career, and he was a SXSW fixture for the next five years. But Ryan hasn’t been back to SXSW since 2001, even longer than his North Carolina hiatus. So when the late-breaking announcement came that he’d be appearing this year, it seemed like a case of synchronicity that was just too good to pass up. Of course I went, because how could I not? No, Ryan and I didn’t have any sort of showdown over “Losering.” I kept my distance, content with watching the show as just another face in the crowd. And how was it? I’d rate it good, if also intermittently anticlimactic for me — which is okay. The show I’d like to see Ryan play does not interest him, just as his recent guises as jam-band guitar god and generic Bryan Adams acolyte don’t much interest me. That said, those songs were fine and earned an enthusiastic crowd response. Ryan’s between-song patter was also amusing as ever, if a tad grumpy. “It’s none of the songs you like,” he said in response to whoops from the audience when he strapped on an acoustic guitar. “What show do you think you’re at? Crowd-pleasing Ryan Adams is at a different hotel.” The odd part was that this was preamble to 2001’s “New York, New York,” which is still the closest thing Ryan’s ever had to a hit single. I ain’t ready to go. I’m never ready to go. I think the thing you said was true. I’m gonna die alone and sad. I misted up in spite of myself, thinking about what a long strange trip it’s been since those Whiskeytown shows way back when. My trusty pal Peter Blackstock shot a bit of video of “Winding Wheel,” and I’m glad we have this souvenir (he also reviewed the show here). Ryan’s 14-song set didn’t have anything from Whiskeytown, which wasn’t surprising. That’s back in North Carolina, so…you know. Anyway, I was glad I went to see him again, after all this time. But I’m not sure when I’ll go again. So yeah…Not that there was really any doubt, but it’s starting to sink in that this is really happening. I might even have to snag one of these here posters. Wednesday night is zero hour. We’ll see how it goes! Near as I can tell, it’s been close to 11 years since I was knowingly in the same room as Ryan Adams. It happened in June 2005, the last time he played a show in his old hometown of Raleigh, a night that was deeply emotional all the way around (more about that is in chapter 16 of “Losering”). It’s been easy enough to keep my distance from Ryan since then, because that was the last show he played anywhere in North Carolina. In fact, he seems to go out of his way to avoid playing his native state nowadays. In the fall of 2011, when I was writing “Losering” and Ryan was touring for his Ashes & Fire album, I did ponder whether or not to get on a plane to go see him play somewhere else. But the timing didn’t really work out, as far as making it happen before the book’s deadline. So I let it go, and I’ve been content to leave my Ryan live experiences in the past. Next week, however, I’ll be in Austin, Texas, for South By Southwest. And wouldn’t you know it, Ryan was just added to the schedule, which will be his first SXSW appearance since the early 2000s. He and his fellow North Carolina natives the Avett Brothers are to co-headline a showcase sponsored by Marriott Hotels. And in spite of it all — his non-cooperation, the fact that I haven’t really loved an album he’s done in many a year, and on and on — the sad truth remains that I don’t see how I can stay away. 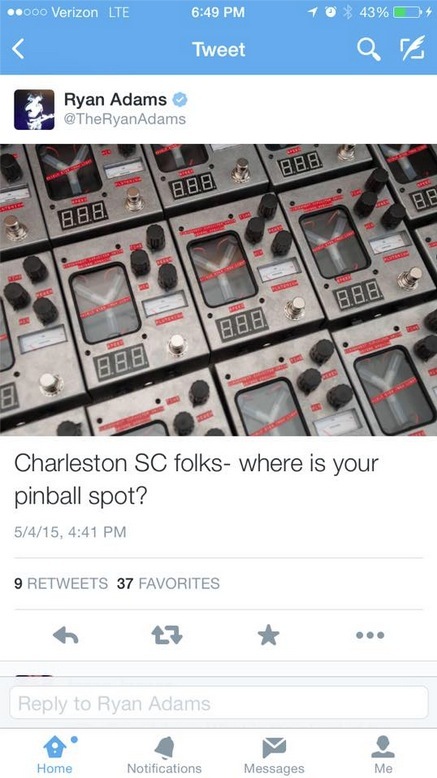 So yeah, Ryan Adams’ self-imposed Old North State exile remains in effect, with no sign it will end anytime soon. But even if Ryan himself doesn’t come around here anymore, at least that doesn’t seem to keep any of his associates away. By the close of this coming weekend, in fact, two of his most recent production clients will have headlined shows here within the span of a week. 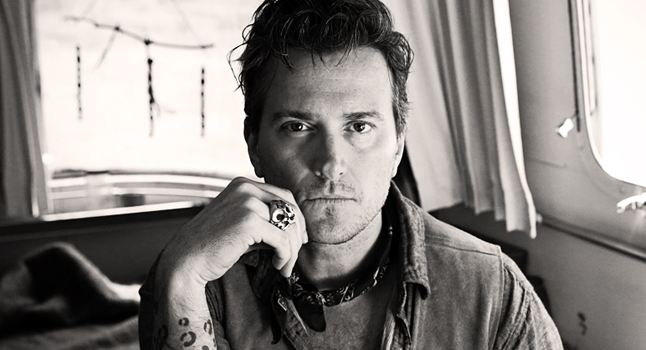 Following Jenny Lewis in Saxapahaw this past Monday, the next in line is onetime Marvelous 3 leader Butch Walker, who plays Durham’s Carolina Theatre on Sunday night. Ryan produced Walker’s lovely new album Afraid of Ghosts (Dangerbird Records), which (1) was released on a label run by Whiskeytown’s old manager, oddly enough; (2) is, like Lewis’ The Voyager and the most recent effort from Ethan Johns, yet another Ryan-produced record that I find vastly superior to last fall’s Ryan Adams; and (3) has kind an ironic title, given that something like a fear of old ghosts might well be what’s kept Ryan away for so long. The ghost has got me runnin’, indeed. Anyway, a bit more verbiage about Walker from the paper can be found here. Aw, bless your hearts, you crazy naive kids. And yet the question did have some apparent plausibility, all things considered. Lewis and Ryan are chums, he produced her 2014 album The Voyager and she accompanied him to the Grammys this past spring. More to the point, Lewis is the support act on the current leg of his tour, in which capacity she opened for Ryan Sunday night in Charlottesville and will do the same Tuesday night in Charleston. 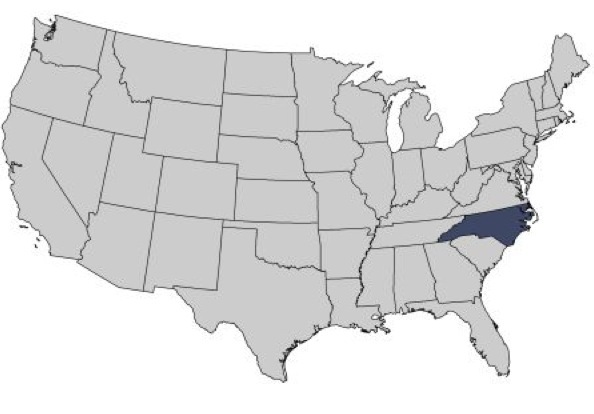 Yes, it’s hard not to notice that his tour routing seems designed to surround North Carolina without playing it, hitting every adjoining state except us with such deliberation that it has to be on purpose (and we’re coming up on the 10-year anniversary of the last time he played Raleigh). Anyway, Ryan again bypassing the state that lies between Virginia and South Carolina left a hole in the tour schedule Monday night. 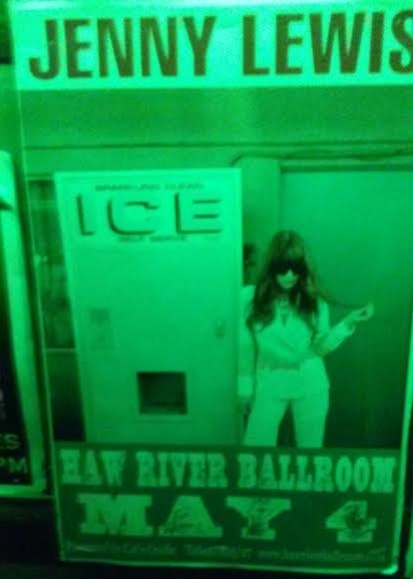 So Lewis took the opportunity to play a headlining show of her own at the Haw River Ballroom, in the old mill town of Saxapahaw about an hour west of Raleigh. And if Ryan were to get a wild hair and decide to make an impulsive settle-up gesture with the Old North State, sort of like what he did with “Summer of ’69” at the Ryman last week, an unannounced cameo some distance away from his former downtown Raleigh stomping grounds seemed as likely as anything else. So of course, it didn’t happen. Lewis played her show and it was quite fine, but Ryan did not appear. The only mention of him onstage was a story Lewis told at the end of her set about Ryan forcing her to write one more song for The Voyager — which he didn’t like, so she made it the album’s title track (ha!). Gotta say, I do like The Voyager a lot more than Ryan Adams, and hearing its songs live underscored that; especially “The New You,” which is still bouncing around my head a day later.